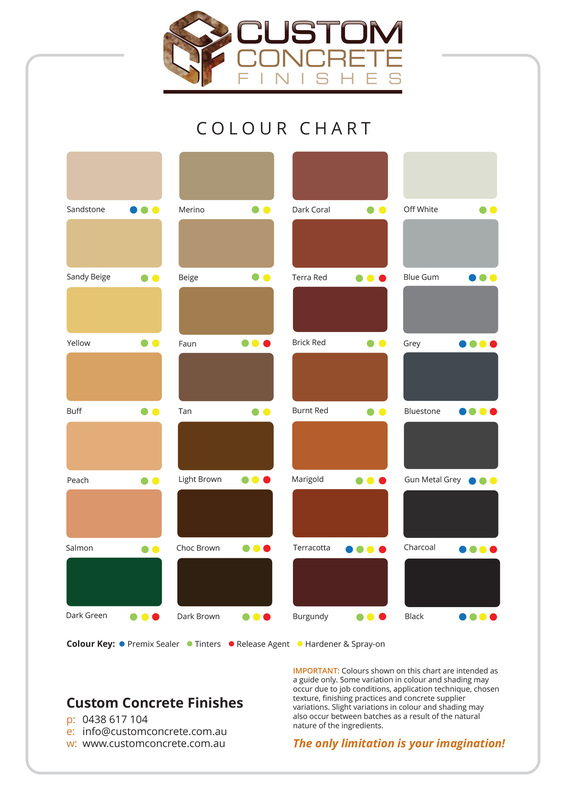 Click here to download a sample Colour Chart. Colour’s shown on this chart are intended as a guide only. Some variation in colour and shading may occur due to job conditions, application technique, chosen texture, finishing practices and the concrete. Product variations in colour and shading may also occur between batches as a result of the natural nature of the ingredients. Refresh your tired, old concrete. 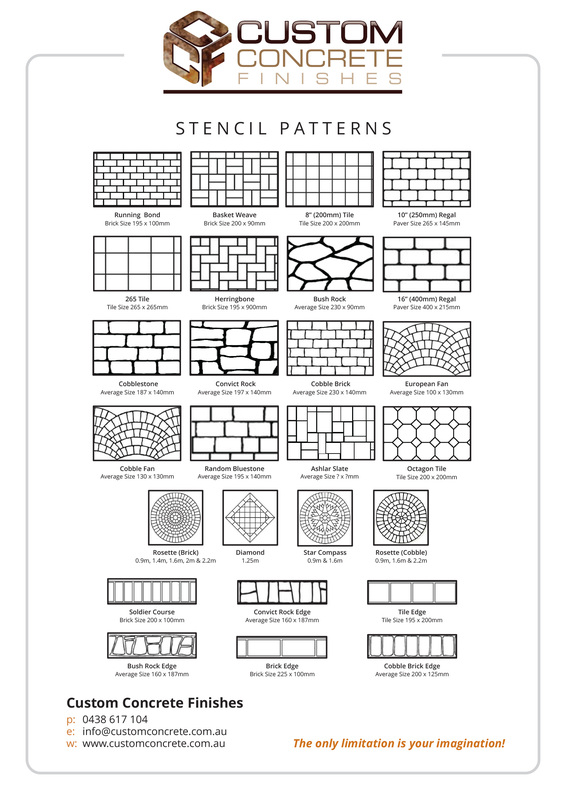 Click here to download a sample Pattern Chart. Specifications and designs subject to change without notification. Stencil patterns, colours and designs can be applied to new and existing concrete to enhance or rejuvenate any concrete surface. Removal of any foreign materials – paint, old sealer, old concrete, mortar etc. Grinding of rough edges, trip hazards and repair of holes from old posts etc. Grinding of cracks, depending on what cracks are present. Acid washing and high pressure cleaning of area. The preparation of the concrete surface is extremely important as the long lasting nature of spray-on paving is dependant on adhesion. Masking of walls etc. to prevent overspray of product damaging other surfaces. A primer coat is then applied which supports in the molecular bonding process of the spray-on pattern paving to the original concrete surface. Levelling of surface – if going over exposed aggregate for example. If required a base coat is applied in the colour of your choice. This becomes the mortar or grout line of your new spray-on pattern paving. The stencil pattern concrete paving, including a border if required, is now installed on top of the base coat and fixed to the surface. Spraying of border colour. 2-3 coats of your border then sprayed. When the border is properly dried it is covered up. Spraying of main colour – usually two coats are applied, the final coat providing the textured anti-slip safety surface. Removal of stencil pattern and cleaning of surface. Application of sealant – usually two coats is applied to protect your new spray paving for many years to come. Area is roped off so that no objects of weight can be placed on the finished concrete driveway surface or driven over for a minimum of 5 days after completion. Area should be resealed approximately every two to three years depending on what type of usage and degree of wear and tear. We provide you with information on how to maintain your new spray paving.